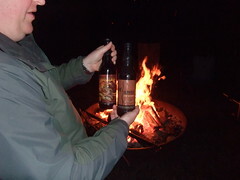 One of my favorite weekend outings is most definitely a camping trip somewhere with a bunch of friends sharing good beers and sitting around a campfire. How can you go wrong with that? If the idea sounds as appealing to you, join WABL for their 2nd Annual Washington Beer/WABL Campout from August 13-15 on Whidbey Island. This is only open to WABL members (21+) and their guests, so if you still aren’t a member and want to go now is the perfect time to sign up on their website. More information from WABL follows. Washington brewers and WABL members are cordially invited to the 2nd annual WA Beer/WABL campout on August 13-15. This time the campout will take place on a private property on Whidbey Island. This is a 21+ only, WA brewer/WABL exclusive event. There is room for 40 WABL members including guests. Each WABL member may bring one non-member guest. This event is hosted by WABL (WAshington Beer Lovers). Needless to say if you are going to bring beer, which I’m sure all of you will, please bring Washington Beer! There is some sheltered sleeping space as well as places to set up tents. A double outhouse on the property and a shower available at the Ebey’s LandingState Park, 1.5 miles from the property. There are state parks with trails and beach nearby and there will be a few local events happening that weekend (Coupevile Arts & Crafts Fair, Greenbank Highland Games, farmers market, etc). This is a private property so we ask that you follow the rules and be respectful to our gracious host. More detail to be emailed to the participants a few weeks before the trip. This is a 21+ only, WA brewer/WABL exclusive event. You must be a current WABL member in August, 2010 to be eligible. You may bring one non-WABL guest but they must be accompanied by a current WABL member. A certain number of spots will be reserved for the Washington Brewers Guild member brewers. Other WABL members whom you wished to be grouped with and therefore don’t want to be separated (i.e. husband gets picked and wife doesn’t). Please write down all the names in your group and indicate that you do not want to be separated. I like the picture with two non-Washington Beers in it. This is such a great idea. I can’t wait until I live in Washington and can actually participate!